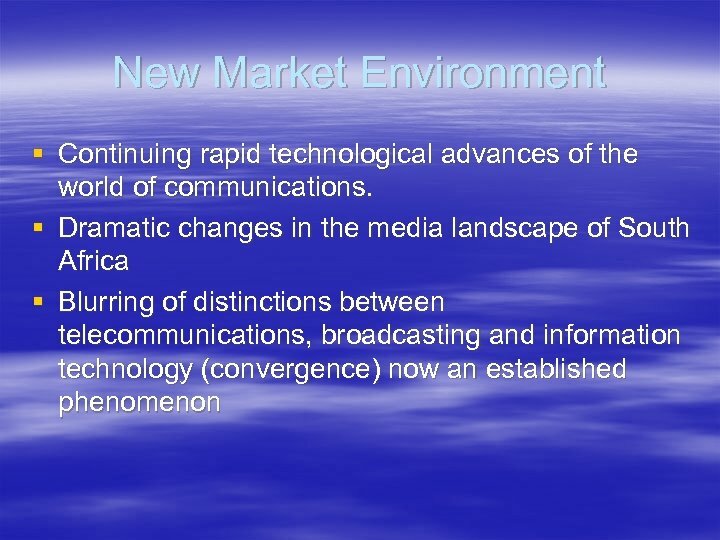 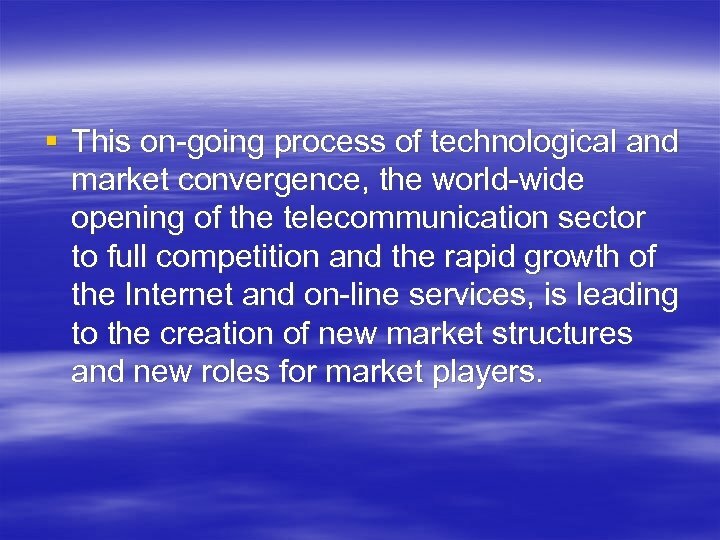 § This on-going process of technological and market convergence, the world-wide opening of the telecommunication sector to full competition and the rapid growth of the Internet and on-line services, is leading to the creation of new market structures and new roles for market players. 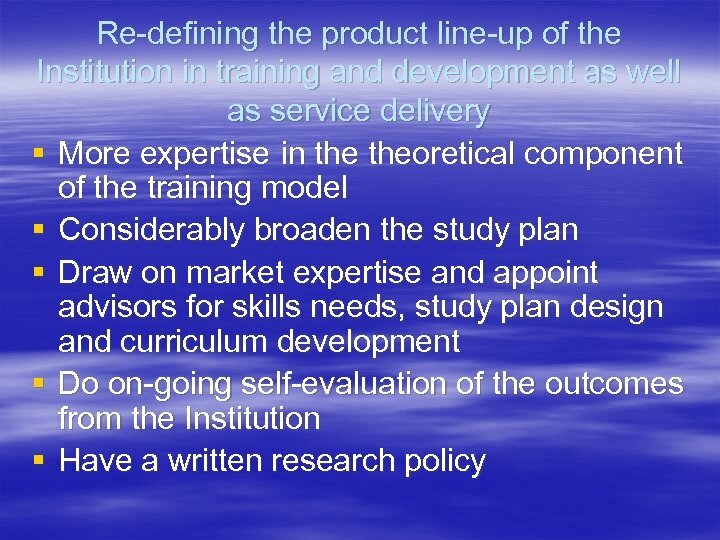 § These dynamics have created new challenges for the training and development and multi-skilling of new and existing participants in a highly volatile market environment. 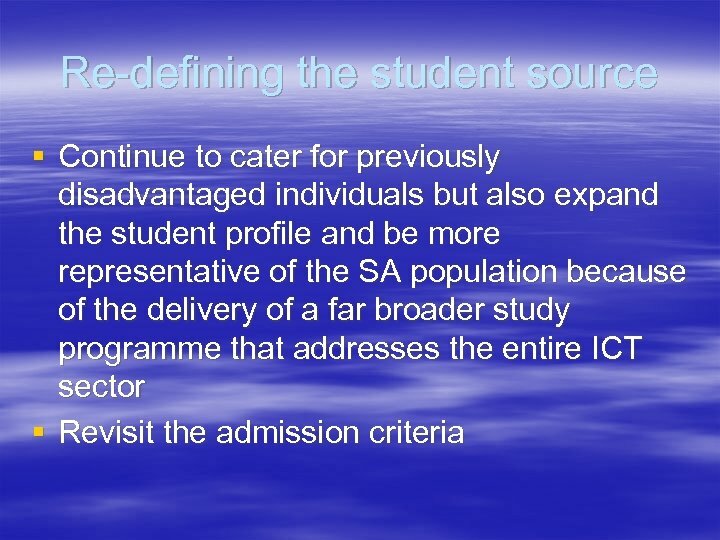 § South Africa, in particular, has a shortage of newly skilled people. 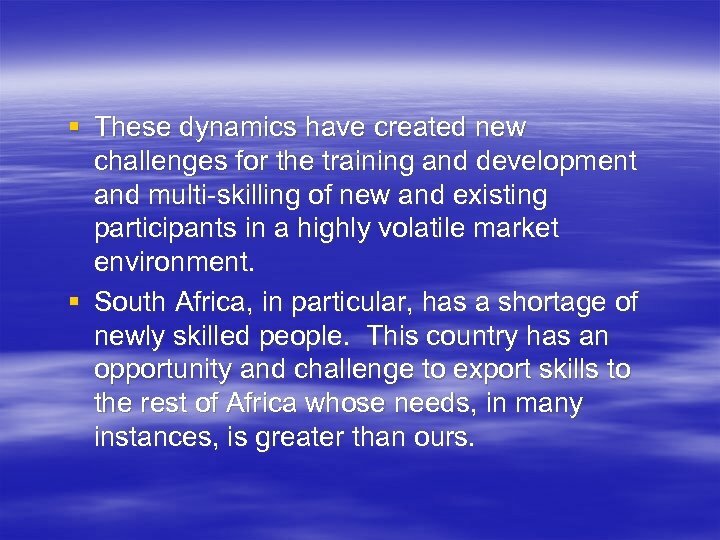 This country has an opportunity and challenge to export skills to the rest of Africa whose needs, in many instances, is greater than ours. 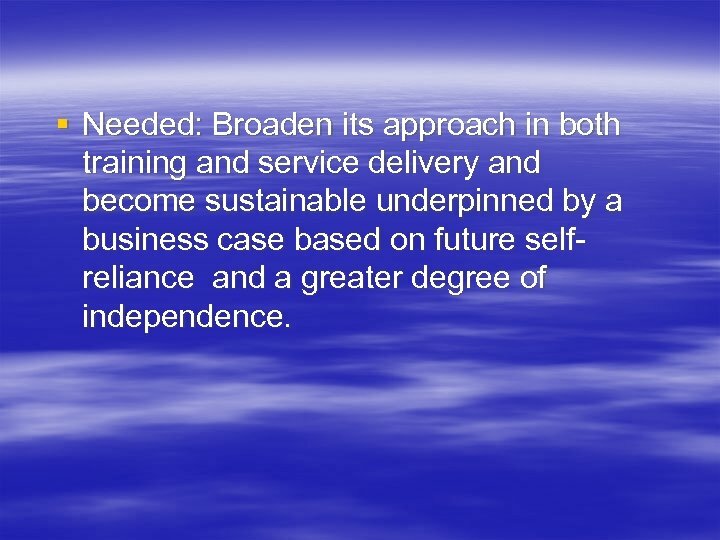 § Needed: Broaden its approach in both training and service delivery and become sustainable underpinned by a business case based on future selfreliance and a greater degree of independence. 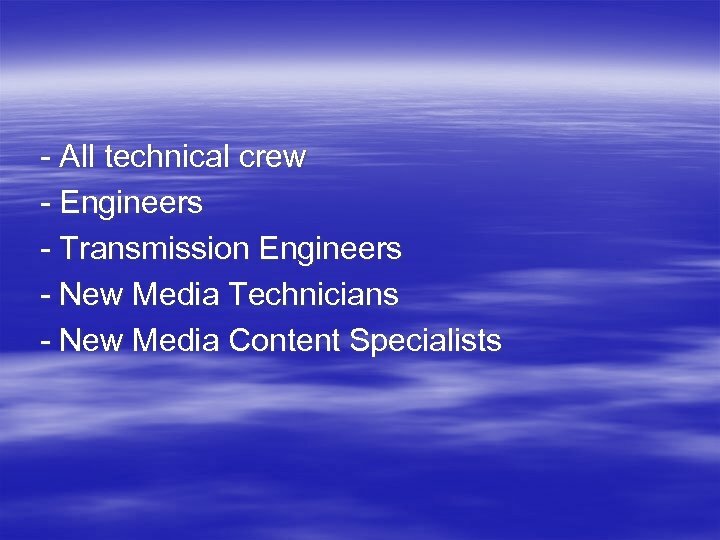 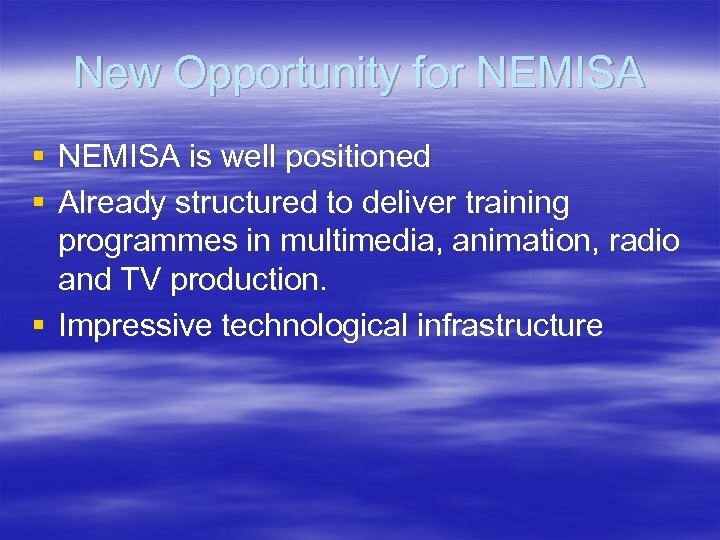 NEMISA NEW MANDATE § To take NEMISA into the future and offer a new product in skills and content generation that will make the Institution an advanced multi-media skills developer and content generator as a sustainable, relevant, effective, self reliant, industry-led and independent business operation in an increasingly changing technological environment. 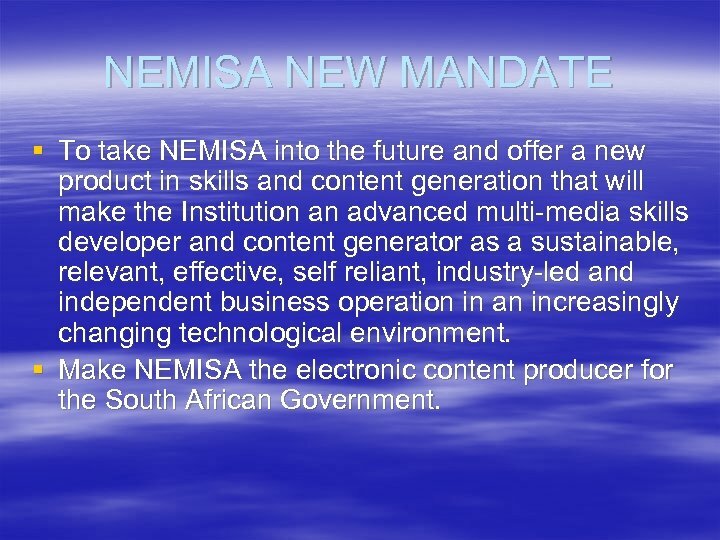 § Make NEMISA the electronic content producer for the South African Government. 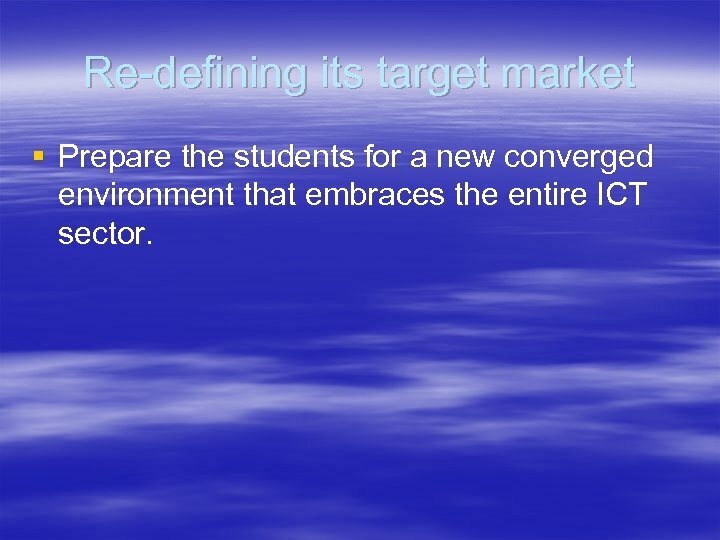 Re-defining its target market § Prepare the students for a new converged environment that embraces the entire ICT sector. 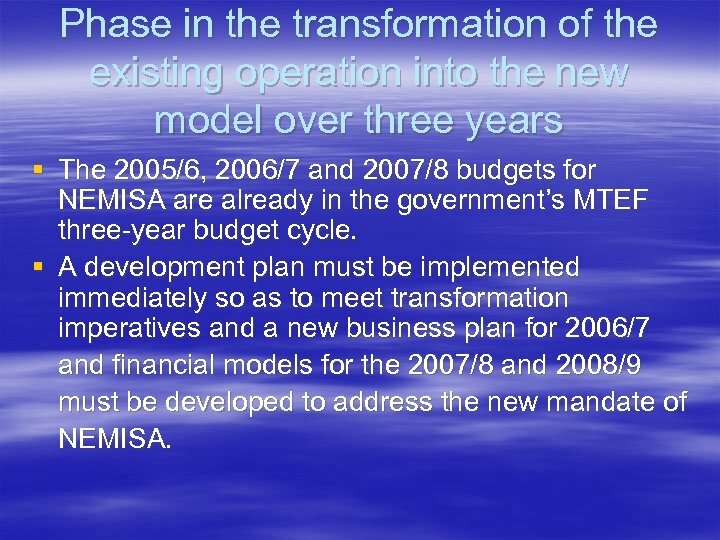 Phase in the transformation of the existing operation into the new model over three years § The 2005/6, 2006/7 and 2007/8 budgets for NEMISA are already in the government’s MTEF three-year budget cycle. 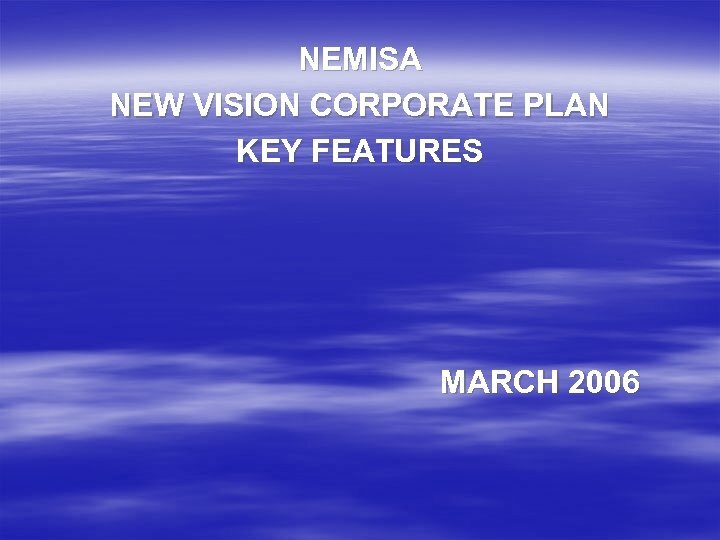 § A development plan must be implemented immediately so as to meet transformation imperatives and a new business plan for 2006/7 and financial models for the 2007/8 and 2008/9 must be developed to address the new mandate of NEMISA. 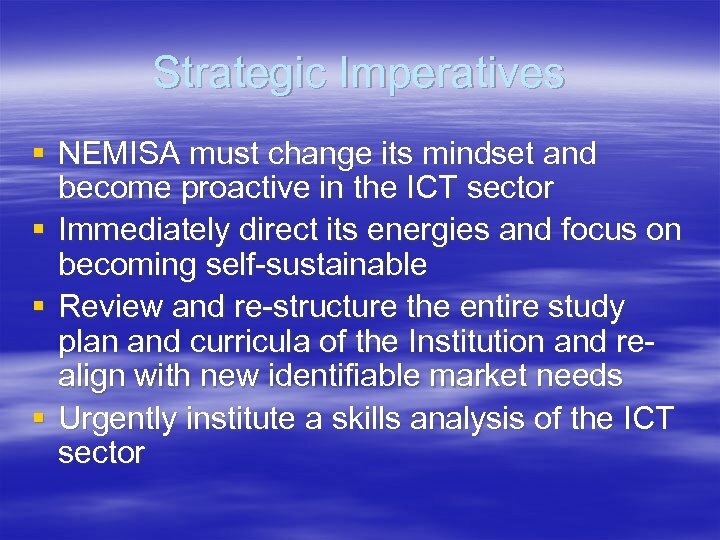 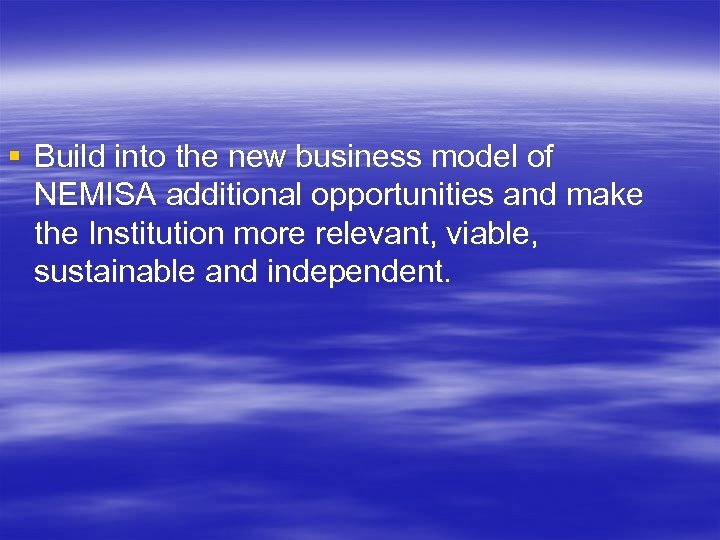 § Build into the new business model of NEMISA additional opportunities and make the Institution more relevant, viable, sustainable and independent. 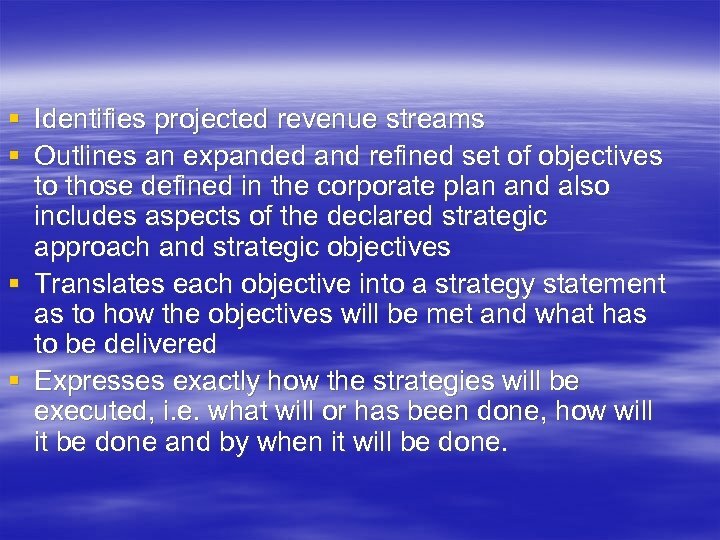 § Identifies projected revenue streams § Outlines an expanded and refined set of objectives to those defined in the corporate plan and also includes aspects of the declared strategic approach and strategic objectives § Translates each objective into a strategy statement as to how the objectives will be met and what has to be delivered § Expresses exactly how the strategies will be executed, i. e. what will or has been done, how will it be done and by when it will be done. 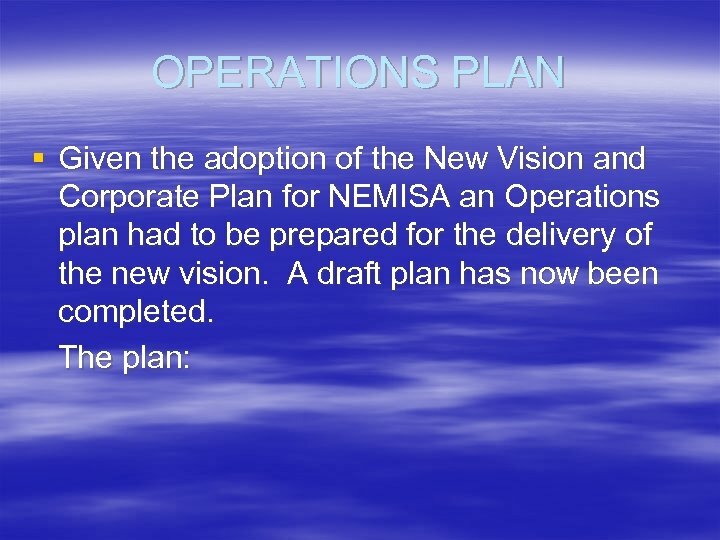 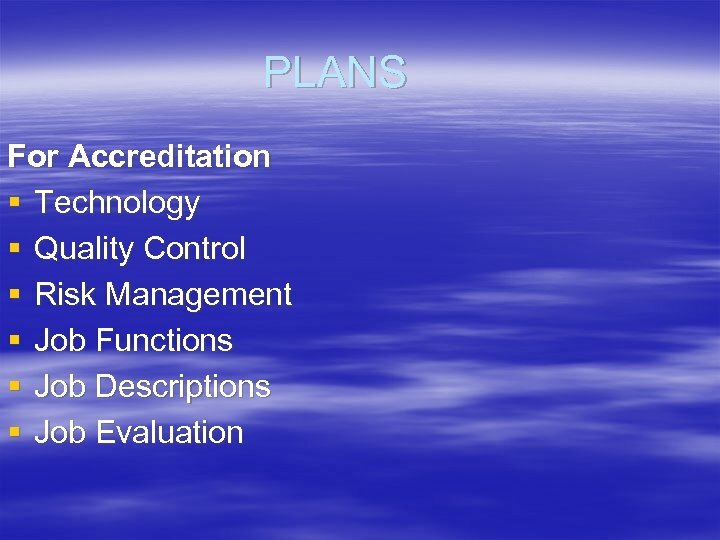 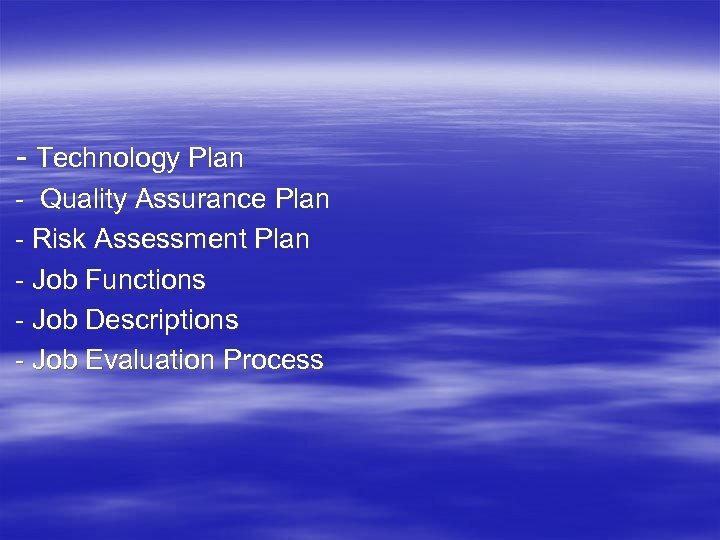 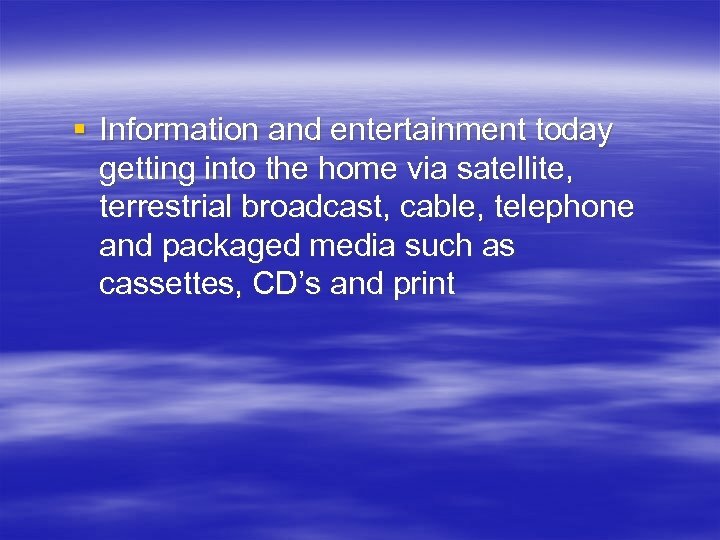 § The draft plan was completed October 2005. 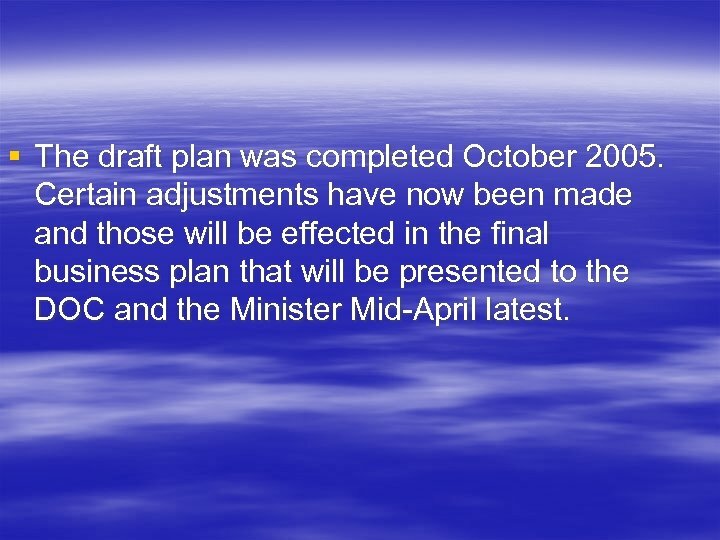 Certain adjustments have now been made and those will be effected in the final business plan that will be presented to the DOC and the Minister Mid-April latest. 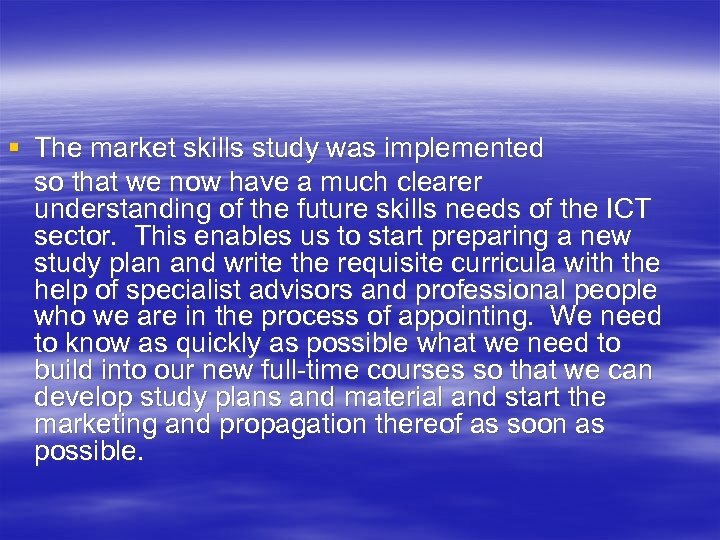 § The market skills study was implemented so that we now have a much clearer understanding of the future skills needs of the ICT sector. 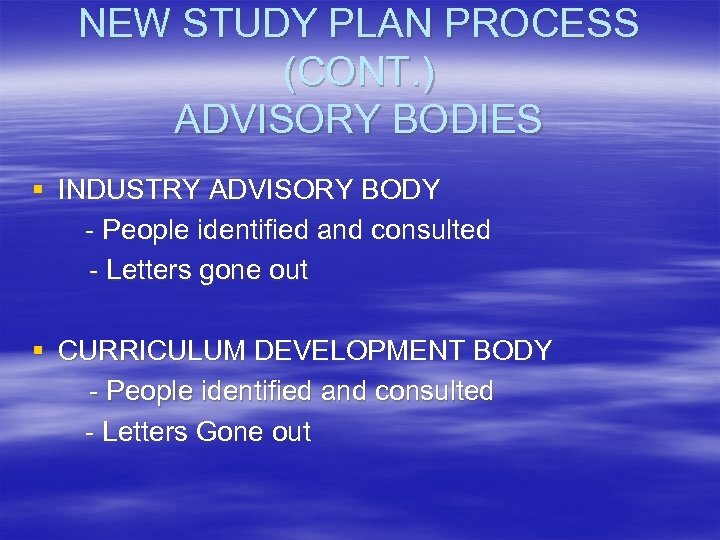 This enables us to start preparing a new study plan and write the requisite curricula with the help of specialist advisors and professional people who we are in the process of appointing. 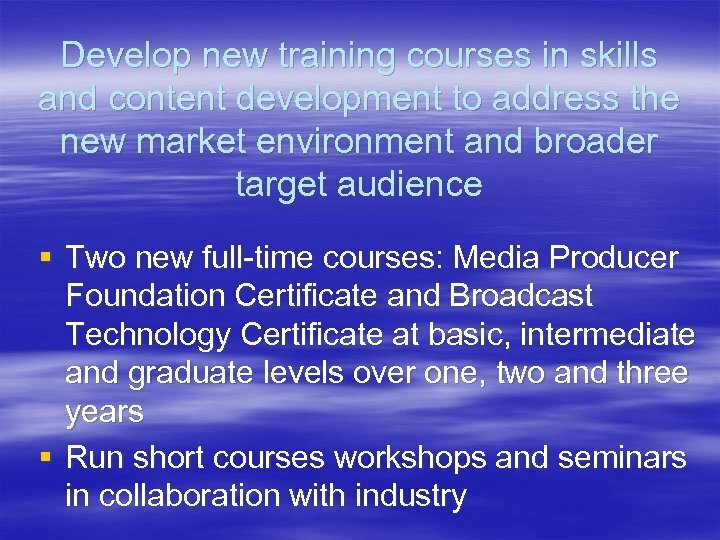 We need to know as quickly as possible what we need to build into our new full-time courses so that we can develop study plans and material and start the marketing and propagation thereof as soon as possible. 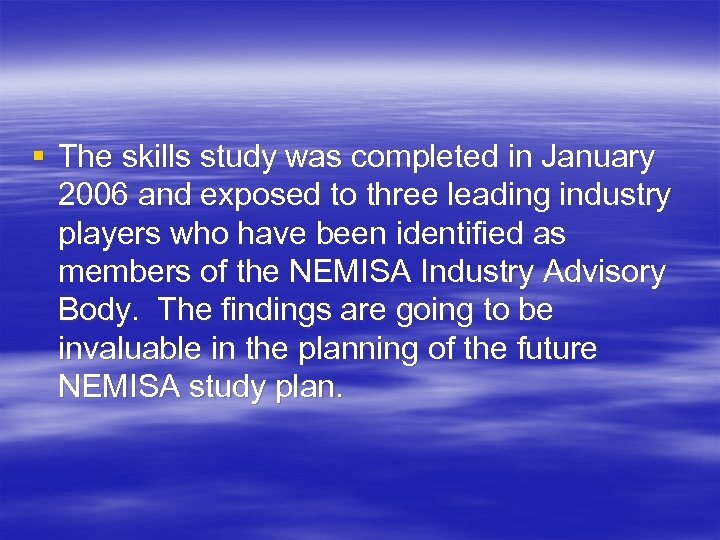 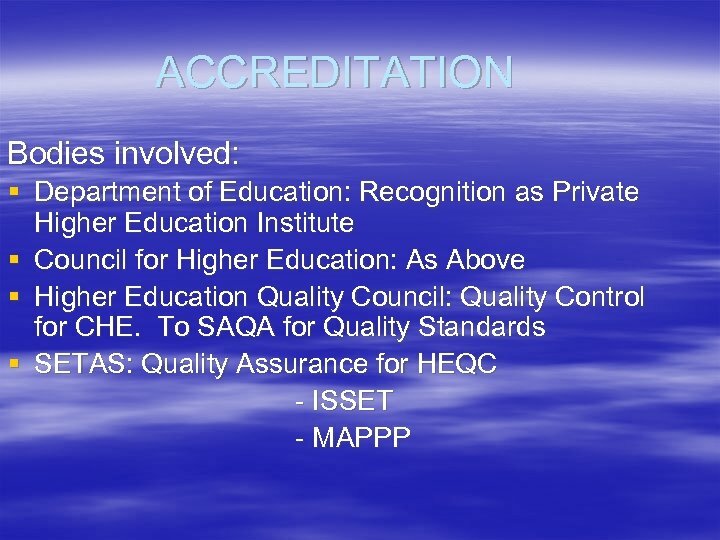 § The skills study was completed in January 2006 and exposed to three leading industry players who have been identified as members of the NEMISA Industry Advisory Body. 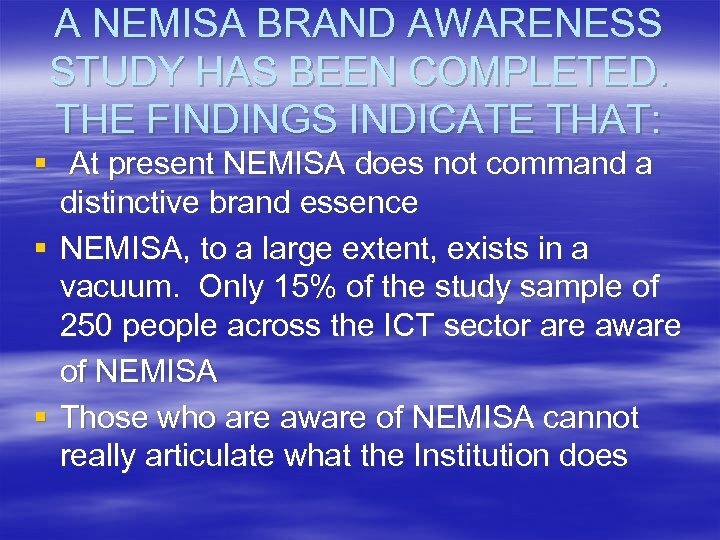 The findings are going to be invaluable in the planning of the future NEMISA study plan. 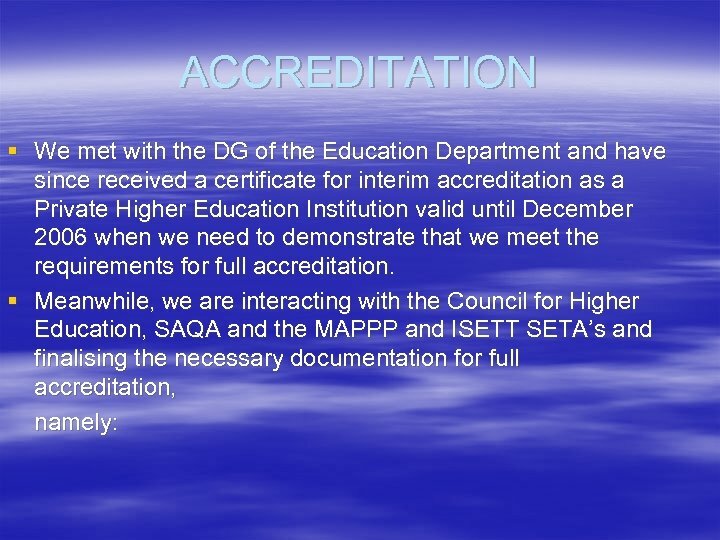 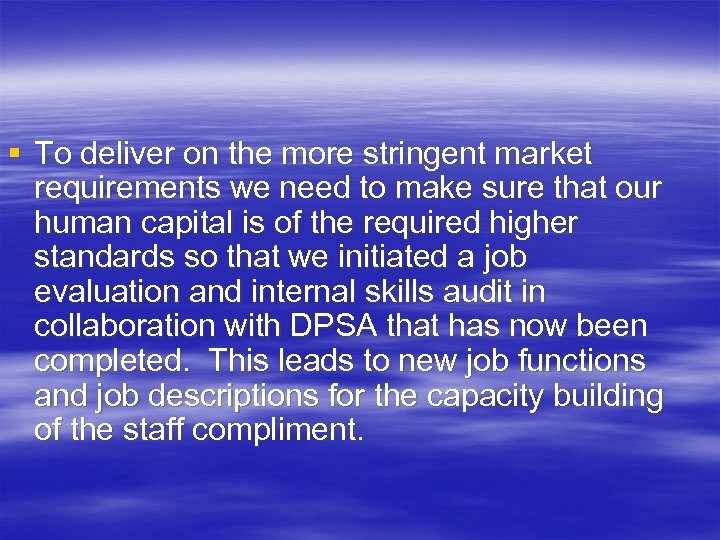 § To deliver on the more stringent market requirements we need to make sure that our human capital is of the required higher standards so that we initiated a job evaluation and internal skills audit in collaboration with DPSA that has now been completed. 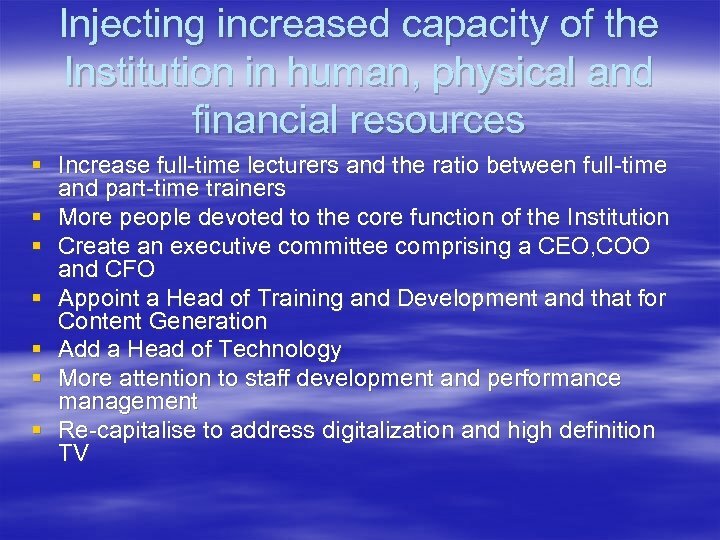 This leads to new job functions and job descriptions for the capacity building of the staff compliment. 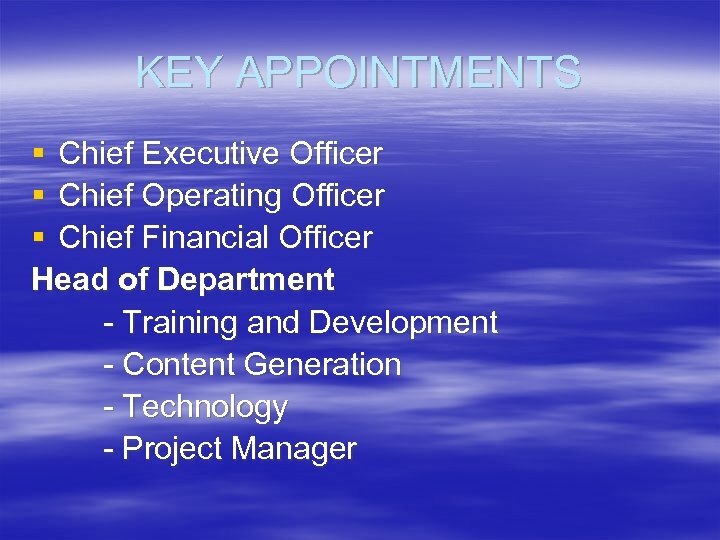 § Key new appointments were identified in the corporate plan and we need those people urgently as we do not have the capacity to do all of the work in the transformation plan. 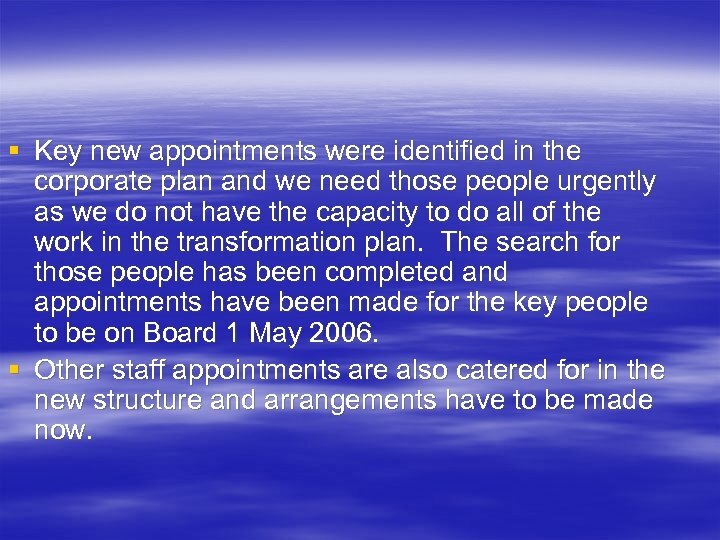 The search for those people has been completed and appointments have been made for the key people to be on Board 1 May 2006. 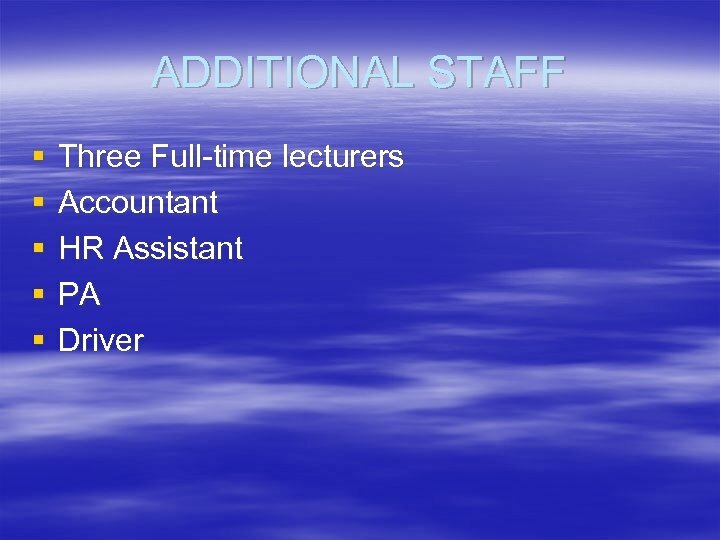 § Other staff appointments are also catered for in the new structure and arrangements have to be made now. 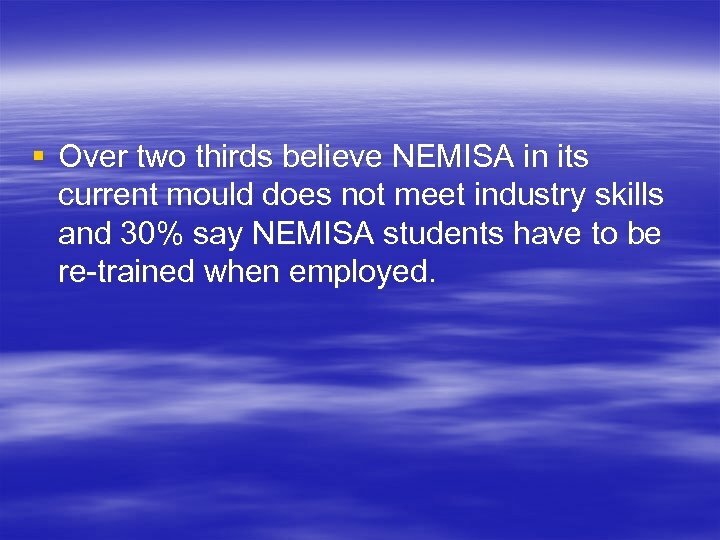 § Over two thirds believe NEMISA in its current mould does not meet industry skills and 30% say NEMISA students have to be re-trained when employed. 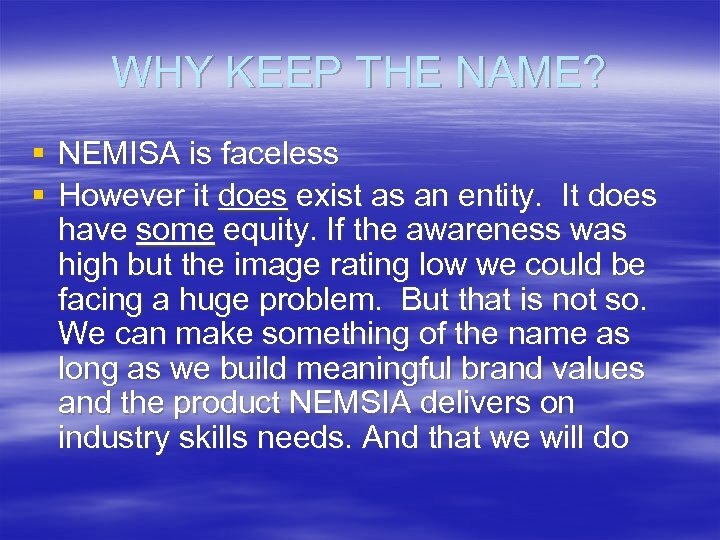 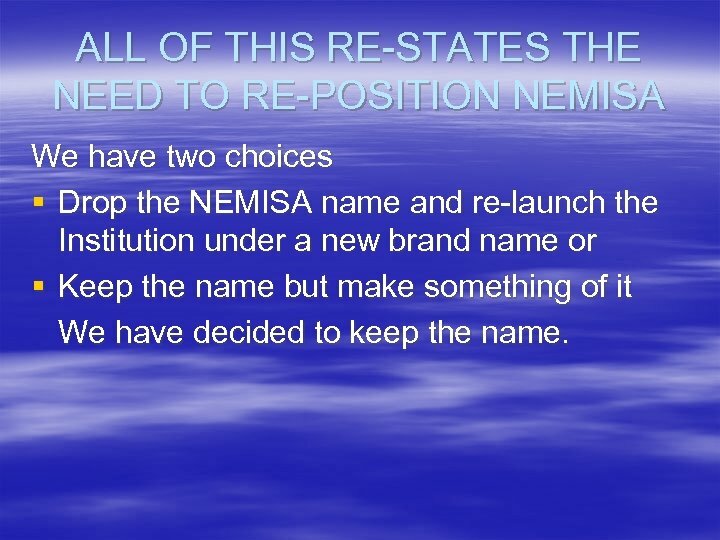 ALL OF THIS RE-STATES THE NEED TO RE-POSITION NEMISA We have two choices § Drop the NEMISA name and re-launch the Institution under a new brand name or § Keep the name but make something of it We have decided to keep the name. 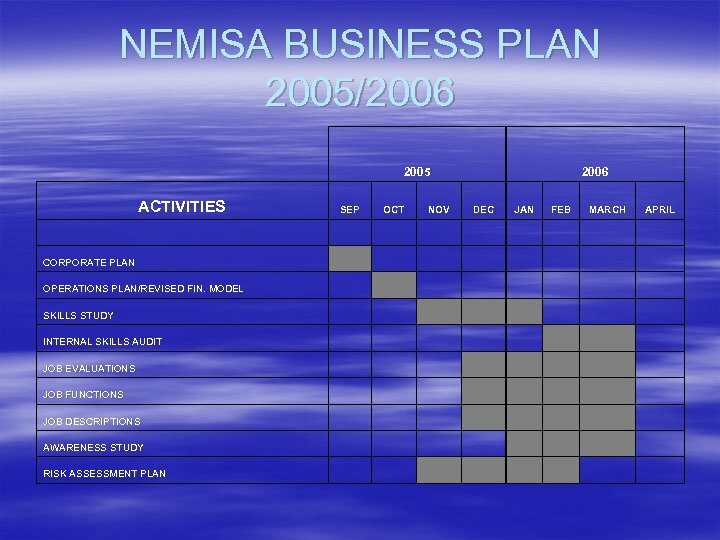 NEW STUDY PLAN PROCESS (CONT. ) 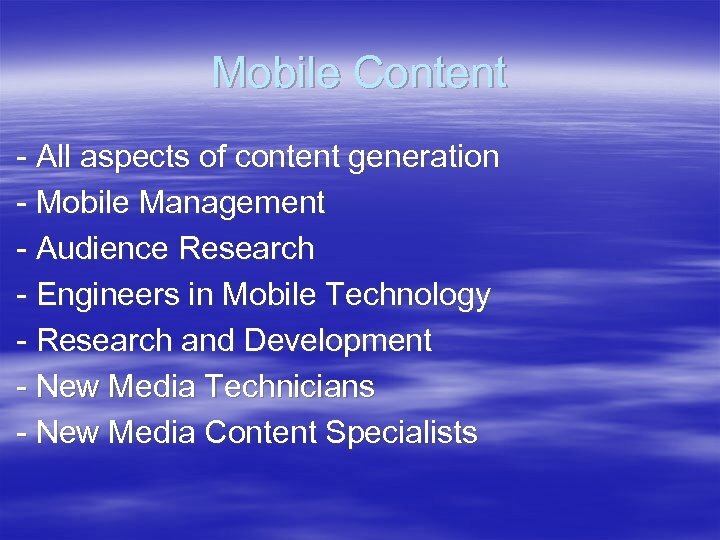 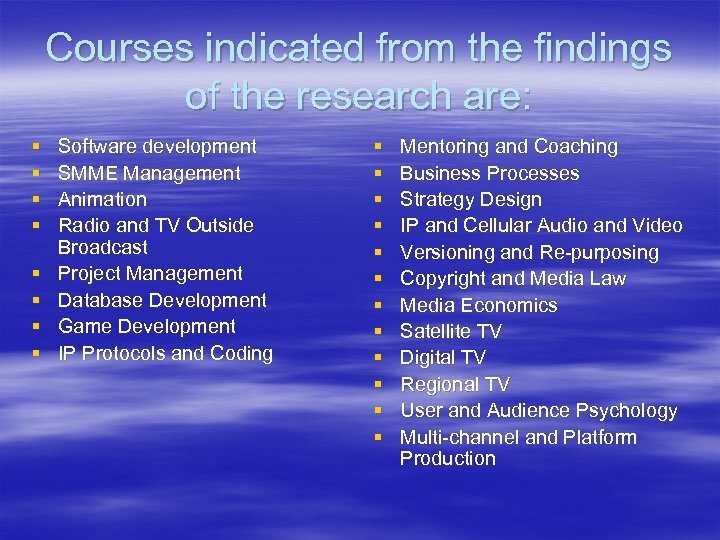 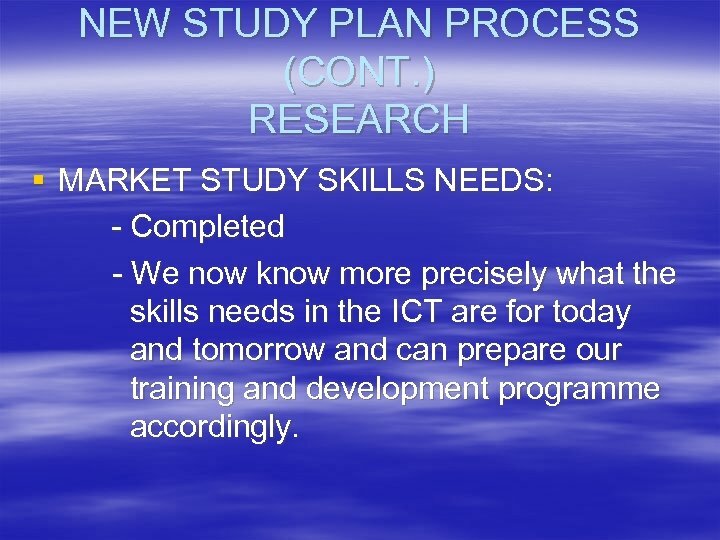 RESEARCH § MARKET STUDY SKILLS NEEDS: - Completed - We now know more precisely what the skills needs in the ICT are for today and tomorrow and can prepare our training and development programme accordingly. 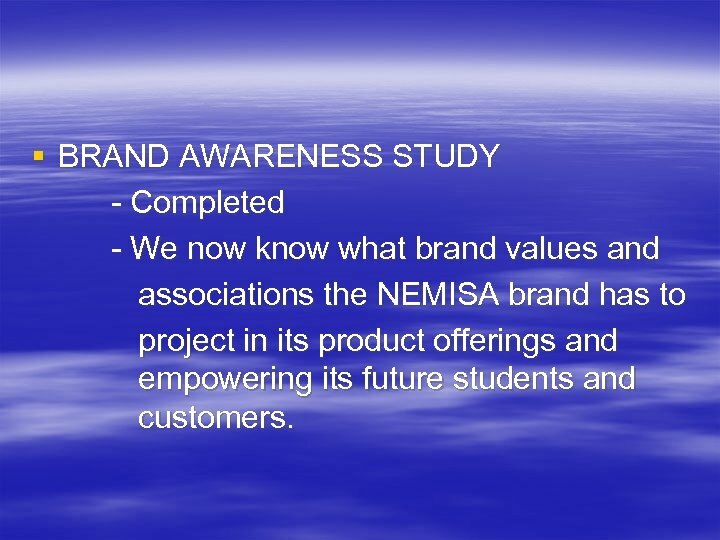 § BRAND AWARENESS STUDY - Completed - We now know what brand values and associations the NEMISA brand has to project in its product offerings and empowering its future students and customers. 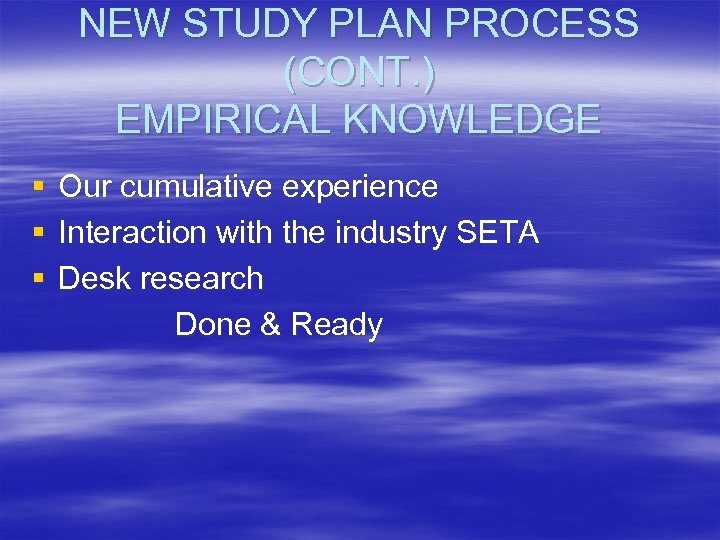 NEW STUDY PLAN PROCESS (CONT. ) 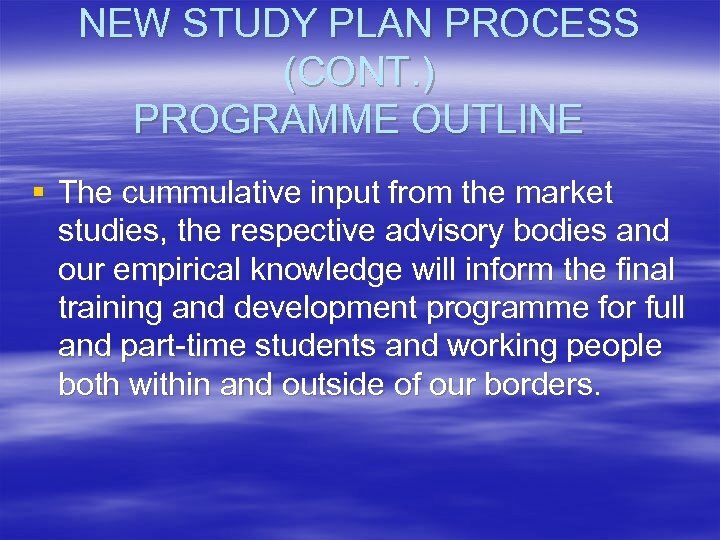 PROGRAMME OUTLINE § The cummulative input from the market studies, the respective advisory bodies and our empirical knowledge will inform the final training and development programme for full and part-time students and working people both within and outside of our borders. 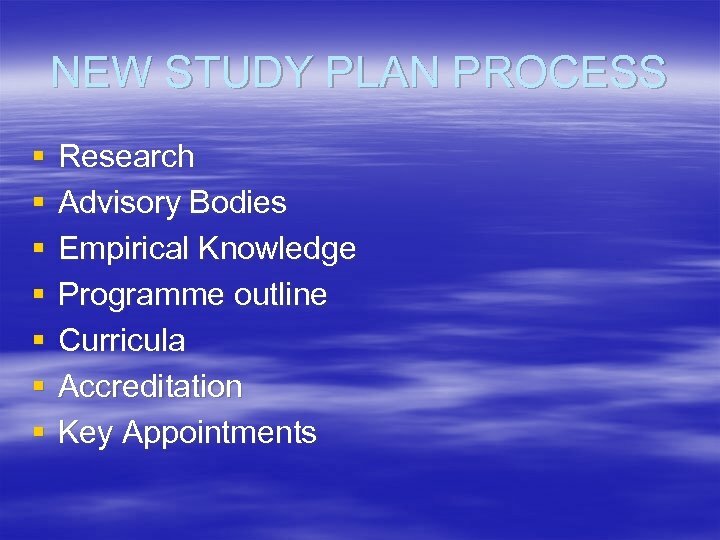 NEW STUDY PLAN PROCESS(CONT. ) 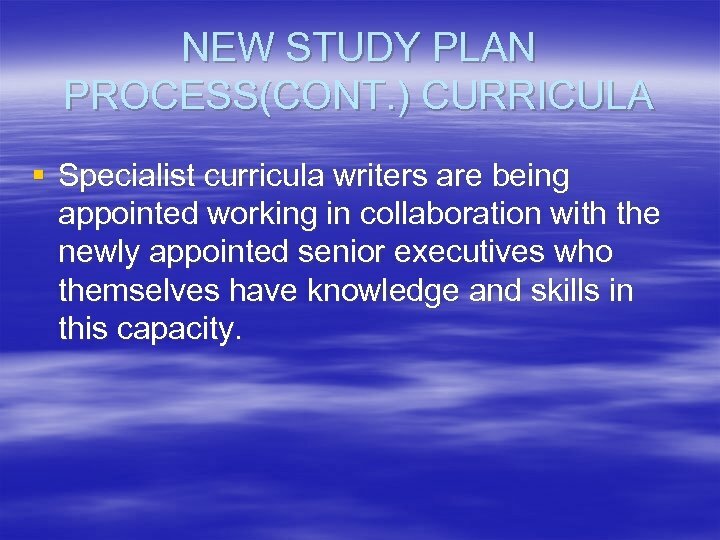 CURRICULA § Specialist curricula writers are being appointed working in collaboration with the newly appointed senior executives who themselves have knowledge and skills in this capacity. 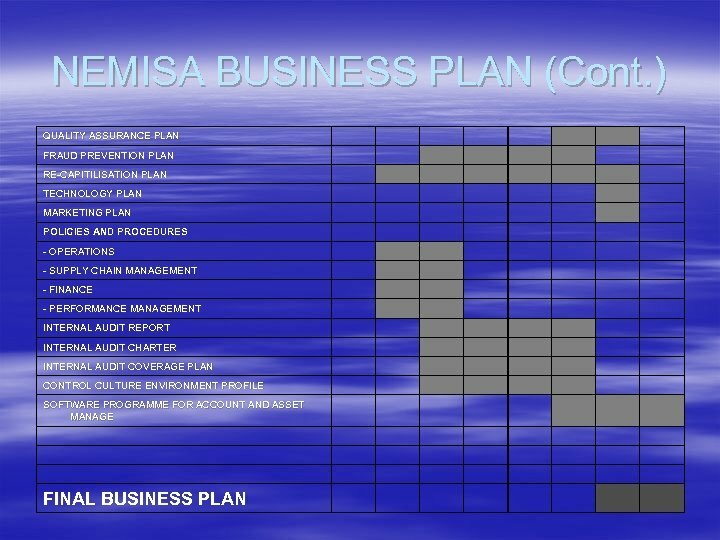 GOVERNMENT PLAN OF ACTION § All state-owned enterprises, of which we are one, have to contribute to the Government Plan of Action and report bi-monthly on progress. 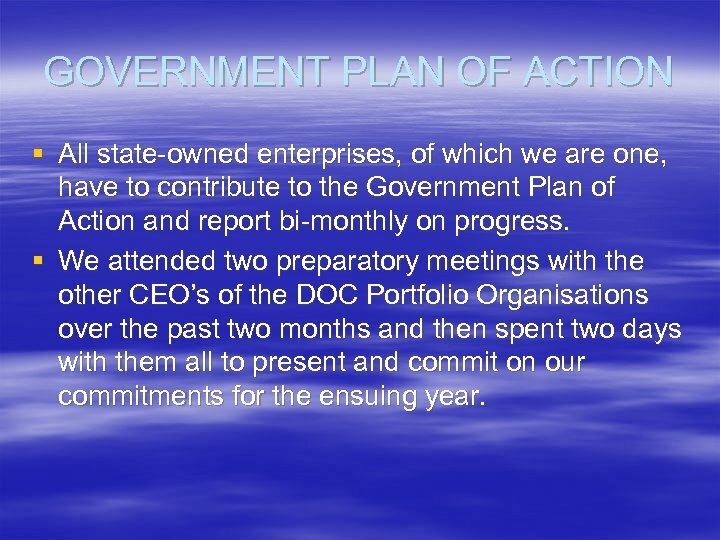 § We attended two preparatory meetings with the other CEO’s of the DOC Portfolio Organisations over the past two months and then spent two days with them all to present and commit on our commitments for the ensuing year. 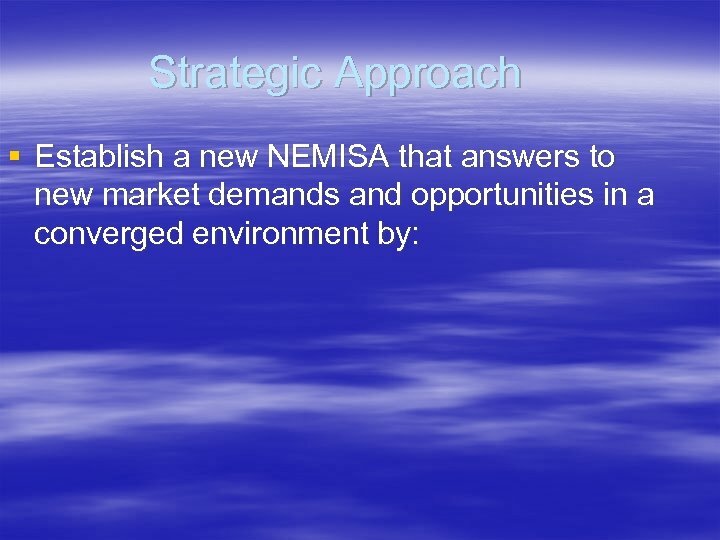 § Whatever NEMISA does in this instance will of course contribute to the welfare of the country at large. 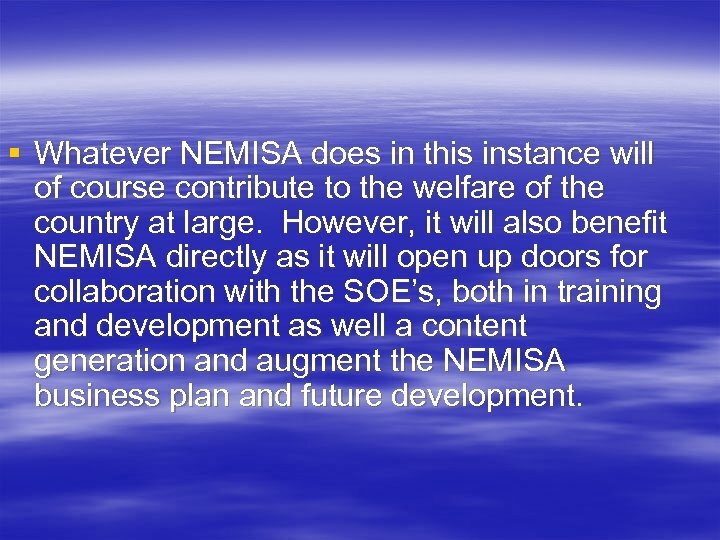 However, it will also benefit NEMISA directly as it will open up doors for collaboration with the SOE’s, both in training and development as well a content generation and augment the NEMISA business plan and future development. 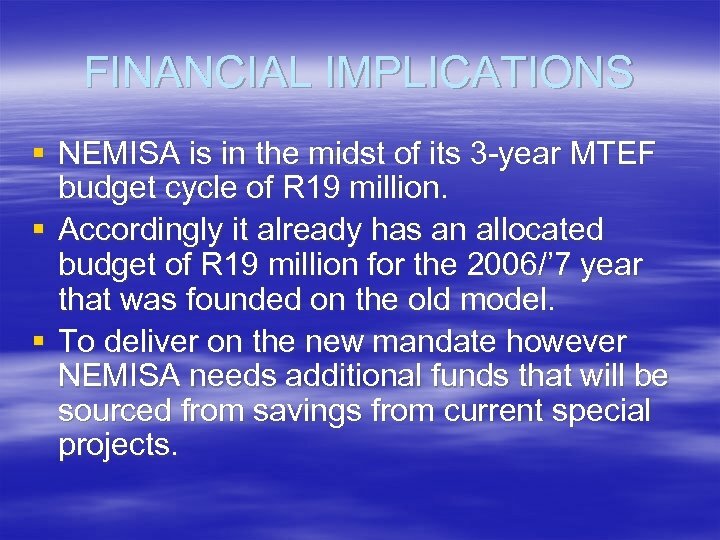 FINANCIAL IMPLICATIONS § NEMISA is in the midst of its 3 -year MTEF budget cycle of R 19 million. 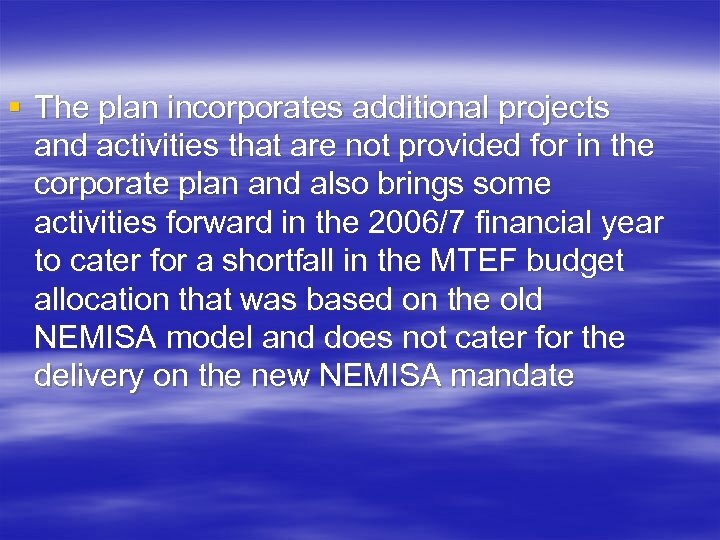 § Accordingly it already has an allocated budget of R 19 million for the 2006/’ 7 year that was founded on the old model. 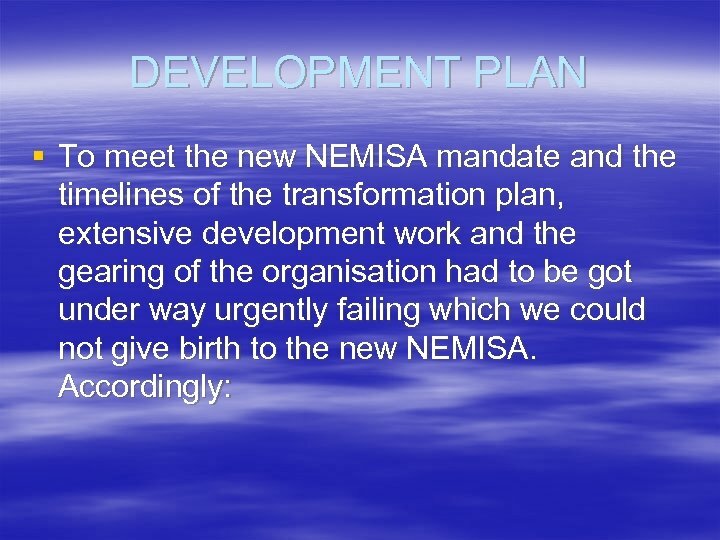 § To deliver on the new mandate however NEMISA needs additional funds that will be sourced from savings from current special projects. 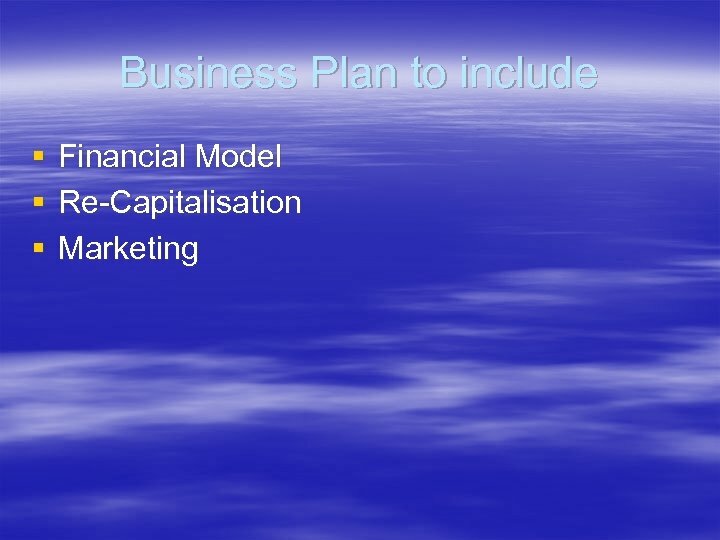 FINANCIAL IMPLICATIONS (CONT. ) 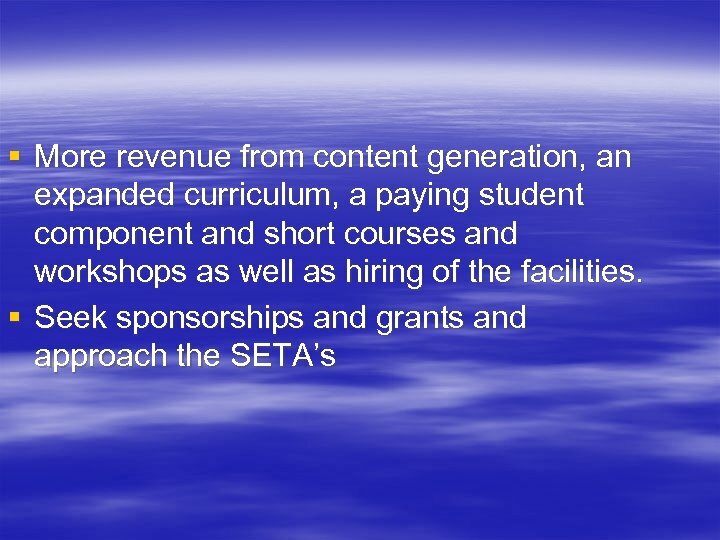 § Meanwhile, the new business model provides for additional training activities and content generation opportunities that are already in the pipeline and that have the potential to grow such that the Institution can become increasingly self-sustainable in the medium term.